May I request a book with the status of "Being Processed" or "In Processing"? - Ask Us! Q. May I request a book with the status of "Being Processed" or "In Processing"? Yes, you may request a book with the status of "Being Processed" or "In Processing". You can make a request by email. Send the book's complete title, the author's name, your name, and your contact information to inprocessrequest@cofc.edu. Also, you can send your request straight from the library catalog. 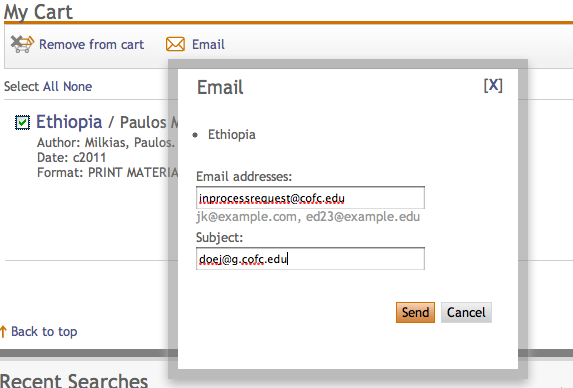 Click "Add to Cart" in the book's catalog record and then email the catalog record from your cart to inprocessrequest@cofc.edu with your contact information in the subject line. See the picture below. Print out the library catalog record for the book you want. Drop the printout off at the Circulation/Reserves Desk or Research & Information Desk. Your request will be picked up within 24 hours and you'll be notified when it is ready for you to check out.